Salma is just 18 years old and, having lost both her parents, she lives with her aunt in Boma Ng’ombe. 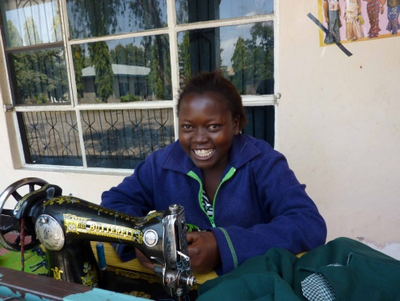 In April 2012 she received a grant of TSH 150,000 to buy a sewing machine so she could start her own tailoring business. She was trained at a local vocational centre for 2 years and continues to learn from another tailor who she now works alongside. As yet her income is small but it enables her to pay for her own personal expenses; soap, lotion, feminine hygiene items, etc. Salma is very grateful for the grant and it is obvious from her smiling face that even this small income has made a big difference to her. Having her own business has given her self- esteem and she is proud of her work. She is now hoping for a small loan so that she can buy some material to hang at the front of her workshop so that passers-by will be able to buy the cloth and employ her to make clothes for them. If you would like to help support more women like Salma, we are currently raising funds for our next round of grants and loans. To help us achieve our target you can donate here.